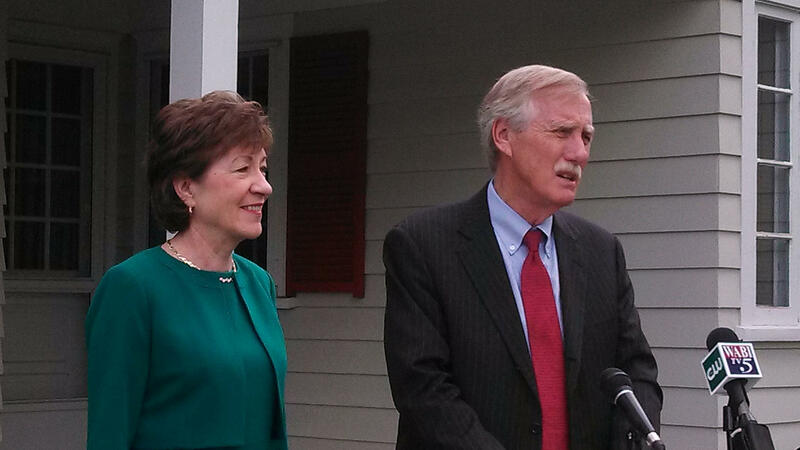 Maine's two U.S. senators together at a news event in Maine in 2014. Maine’s two U.S. senators say they'll wait and see what the hearing process reveals before making a decision on President Trump’s nomination of federal Judge Neil Gorsuch to the U.S. Supreme Court. this nominee's record,” says Sen. Susan Collins, a Republican. Collins comments, and those of independent Sen. Angus King, closely follow what they both said nearly a year ago when President Obama nominated federal Judge Merrick Garland for the vacancy created by the death of Justice Antonin Scalia: They want to see what is said during the Senate Judiciary Committee hearings before deciding how they will vote on Judge Gorsuch's nomination. "At the end of this process, I will make an independent judgment based on whether or not I believe he will interpret the law in accordance with existing statutes and precedent, and most importantly, in accordance with the Constitution,” King says. Judge Gorsuch serves on the Tenth Circuit Court of Appeals, based in Denver. Many consider his judicial record to closely follow that of Justice Antonin Scalia. In a statement issued Tuesday, Maine's newly-installed Republican Party Chair Demi Kouzounas praised the nomination. “Tonight, President Trump fulfilled one of his biggest campaign promises to the American people by selecting Judge Neil Gorsuch, a steadfast conservative and originalist, to serve on the United States Supreme Court. I am certain that Judge Neil Gorsuch will uphold the Constitution, protect our individual rights, and preserve the idea of limited government," Kouzounas says. For Democrats, however, the nomination brings anger. Maine 1st District Rep. Chellie Pingree says the vacancy should not have been President Trump's to fill, but President Obama's. "It’s unconscionable that Senate Republicans kept the seat unfilled for nearly a year for political gain," Pingree says in a statement issued Tuesday. Republicans refused to consider Obama's nomination of Judge Merrick Garland to the high court. Pingree says who fills the court vacancy will have major consequences. "A number of issues will likely come before the Supreme Court in the coming years—among them a woman’s right to make her own health care decisions, voting laws, civil rights, freedom of speech and religion, and protections against gun violence." Pingree says the court will also likely have to rule on the legality of President Trump’s recently-issued ban on refugees. "For the sake of our Constitution and democracy, this justice will need to have the character and courage to stand up against the President who nominated him," she says. "I ask that my colleagues in the Senate do their utmost to find out if Neil Gorsuch is up to that solemn responsibility and hope they make their decision on confirmation accordingly." Women's health organizations in Maine are also weighing in on the nomination, saying Neil Gorsuch is the wrong choice for the court. In a press release, the Mabel Wadsworth Center, Maine FamilyPlanning, and Planned Parenthood of Northern New England, among others, say Gorsuch has a troubling record on women's reproductive rights, including giving priority to the rights of corporations with religious objections over women who need affordable birth control. The women's health groups are urging a rigorous vetting process, and are calling on Sens. Susan Collins and Angus King to make independent evaluations of Gorsuch.